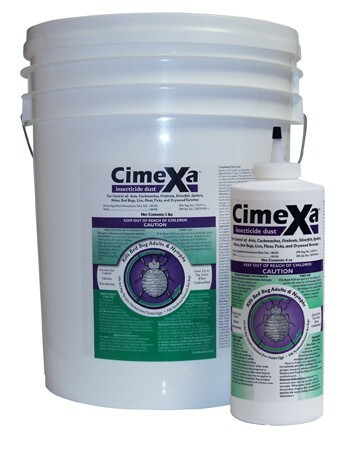 PRODUCT DESCRIPTIONS: CimeXa™ Dust is the premier industry-leading insecticide for control of bedbugs and many other pests. Its engineered silica composition achieves rapid control while remaining viable for up to ten years when undisturbed. With its broad label usage, CimeXa™ Dust is a comprehensive asset for pest elimination to service professionals. TARGET PESTS: For control of bed bugs, fleas, ticks, lice, roaches, ants, firebrats, silverfish, spiders, mites and drywood termites. FEATURES: Kills bed bug adults, nymphs and nymphs hatched from dusted eggs – including pyrethroid-resistant bed bugs. The preferred treatment for brown recluse, yellow sac, hobo and other persistent spiders indoorsLabeled for treating cracks, crevices, voids, mattresses, carpets, pet rest areas, attics and many other areas. Odorless, non-staining desiccant structure will not absorb water vapor except in very high humidity conditions, preventing clumping and maintaining its active ability once applied. Easy to apply – can be used as a dust or mixed with water and sprayed. Low toxicity, engineered silica base exhibits exceptional absorption of water (in liquid form) and oil, which destroys the waxy cuticle of insects, resulting in rapid dehydration and death. Much better consistency and over three times faster compared to diatomaceous earth. Remains viable for up to 10 years when undisturbed. Should not be used in damp areas. RATE OF APPLICATION: Generally 2 oz will cover up to 100 sq/ft. I want to kill the spiders in my basement but I don't want to flush them out into the living spaces. What do you think about using Cimexa dust in conjunction with the Phantom aerosol? Is there a better non repellent to use in indoors? This summer I fogged around the outside of my house with Viper combined with a growth regulator. Next summer I'm going to do the same with Dominion 2L (I don't want to interfere with my termite baits). In my attic and crawl spaces, I'm going to use Drione dust. In my living space I have 2 dogs and a reef tank so, other than using a web remover, I don't know what to do. I've already killed one brown recluse this fall (living room) and I found another one trapped in a spider web (basement). I've also seen some ugly and very fast spiders in my basement as well. Any advice would be appreciated. Before I call in an exterminator, I'd like to try and do this myself. I've had so much success against my outdoor pests using your termite baits, Viper, Bifen XTS, and an awesome fogger. Hopefully you can help me deal with my spider apocalypse. First, the Phantom aerosol would be best for the basement. It just so happens my "main" pest is spiders. I get them on my boat and inside my home. I have hardwood floors throughout my home so spraying a liquid is not an option for cosmetic reasons. Fortunately the Phantom has done a great job for anything that comes inside. Its a non-repellent so it won't chase insects and its virtually odorless. Treatments seem to last 3-4 weeks and its easy to apply. I also use it on my boat to keep spiders from building nests and it stops mud daubers as well. Most importantly, it doesn't leave any sign of being sprayed on the boats deck which is nice. As for the Cimexa; its similar to Drione in that where you apply it, bugs will avoid. So with that being said, I think you'll be best served by using nothing but the Drione – especially for the attic and crawl spaces. But for the basement, stick with the Phantom only. Regarding the Dominion outside; true, it wouldn't impact the termite baits. So for use on the ground where the bait stations are close by, Dominion would be a good choice. You could literally spray it over the landscape and not worry about contaminating the bait stations. But on the structure itself I'd continue to use the Viper. Personally I still find it to be the best overall repelling insecticide for use on my homes exterior and since spiders can "parachute" over the landscape and land on a home, you need a strong working agent on the siding to keep them and other flying pests away. Since many pests won't naturally touch treated surfaces, non-repellents like Dominion will often times not do the job. But surfaces applied with Viper will keep all insects away because they know its there and can't stand to be around it. Oh, and I too have a dog but when used properly, the Phantom is fine for use inside. Just cover the aquarium when treating that room or if you can't cover it, you should still be able to treat all the other rooms. Simply keep the dog out of the room you treat for at least 30 minutes following the application but after that, people and pets can come back to use these rooms as if nothing was ever done once it dries. Let us know if you have any other questions or concerns but from what I can tell from your message, you're well on your way to getting this problem under control for sure.